This course is a great place to start! Your first step on your new career path is to enrol in one of our Introduction to Massage Therapy intensive courses. You may enrol in the Introduction classes as a short course without registering for the full Certificate IV in Massage (HLT42015) or Diploma of Remedial Massage (HLT52015) course. This lets you “test the water” at a low cost. You will be able to experience our teaching methods and learn new skills while assessing if a massage career is for you. The course is deliberately structured so that it is also the foundation for the full Certificate & Diploma course giving you a flying start on your new career. Generally run as a weekend massage course, our massage therapy courses in Melbourne are available at our Heidelberg & Moorabbin campuses. Whether you want to start a career in the massage industry, or study a massage course as a hobby, short massage courses will set you on the right path. 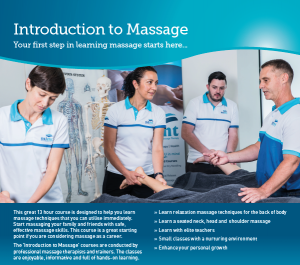 Call the Melbourne Institute of Massage Therapy and Myotherapy and Myotherapy now for more information, or to book for our next intake on 9455 1926! Our Introduction to Massage Course is a non accredited short course and therefore there are no entry requirements just an eagerness to learn new skills. You can enrol by contacting MIMT on 1300 839 839, emailing info@mimt.edu.au or you can purchase your course online via our online shop. Alternatively you can click on the image below and download an enrolment form.